Mitie, the FTSE 250 strategic outsourcing company, has partnered with Remploy, the UK’s leading provider of specialist employment services to people who experience complex barriers to work. 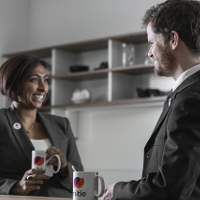 The partnership aims to treble the number of disabled and disadvantaged candidates employed by Mitie over the next three years. Mitie aims to recruit 150 Remploy candidates in 2014-15 and expects that number to reach 400 in 2016-17. Mitie will work closely with Remploy to provide work experience opportunities, share information, and develop a range of appropriate recruitment processes to attract disabled talent and achieve this target. Candidates will undergo intensive pre-employment development training to ensure they are fully supported and prepared for the workplace. Mitie signed the partnership at a recent Disability Awareness Day hosted by Remploy. The event was attended by Mitie’s diversity and inclusion manager, Karen Govier, and Remploy’s chief executive, Beth Carruthers. Mitie was recently recognised at the Opportunity Now Excellence in Practice Awards 2014 with the Directing Diverse Talent Award, and has been listed as a Times Top 50 Employer for Women for the fourth consecutive year.